Google’s call-only ads are an incredibly powerful tool for companies who primarily do business through the phone. Not only can they get your phone to ring when nothing else will, they are entirely trackable so you will know when your ads drive calls and where those calls come from. Now, Google is making the ads even better with expanded headlines and descriptions. Specifically, call-only ads will now include two 30-character headlines instead of a single 25-character headline. Descriptions for call-only ads will also be expanded from 80 to 90 characters. Another small tweak is the placement of business names in the ads, which are being moved to the description line. “We noticed it was tough to fit both your business name and a compelling call to action in the headline, so we moved business name to the beginning of the ad description,” Mike Russo, a Google Ads product manager, said in the announcement. The change makes headlines even more important than ever, as your brand name will no longer be the first thing included in the ad. The upside, however, is that a great headline can help you break past the competition and find success with your ads no-matter how well-known your brand is. The new format is currently rolling out, though it may take a few weeks for the change to reach all advertisers. In mid-2018, Google’s web browser Chrome made a small tweak to help users know how safe a specific site was. Specifically, it added a tag in the search bar flagging any site that had not updated to HTTPS as “not secure”. Now, with the help of a new survey from the agency John Cabot, we are finally getting insight into how this little notification affects people’s perception of sites. Based on a survey of 1,324 people in the UK, the survey finds that nearly half of all people respond negatively to sites which are flagged as “not secure” and many are less willing to give personal information to these sites. According to the findings, 47% of respondents said they “knew roughly what the warning meant.” Similarly, 46% said they would not give their names or financial information to a site flagged as “non-secure”. Even more, 64% of that group say they would immediately leave non-secure sites. Notably, the survey found that a brand’s existing perception appears to play a role in determining how people respond to a non-secure site. For example, retailer John Lewis experienced significantly less negative reactions to their site, despite being tagged as non-secure. This suggests widespread name recognition could potentially counter the warning. Still, the findings of the survey show that a huge number of users are taking note any time they find a business website which has not implemented HTTPS encryption and many are even changing their behaviors based on this warning. If you haven’t updated your business site, these results suggest you could be losing up to 50% of your potential customers to something that is easy and affordable to implement. Unless you are regularly keeping an eye on your site’s analytics, you might never know when you suddenly lose a ton of traffic or clicks. That is somewhat changing, however, as webmasters can now be notified to sudden drops in clicks through Google’s Search Console. Search Console is now sending alerts to webmasters when it detects a “substantial drop” in clicks compared to your past week’s data. Google is doing this by reviewing your week-over-week data in the Performance report for your site. 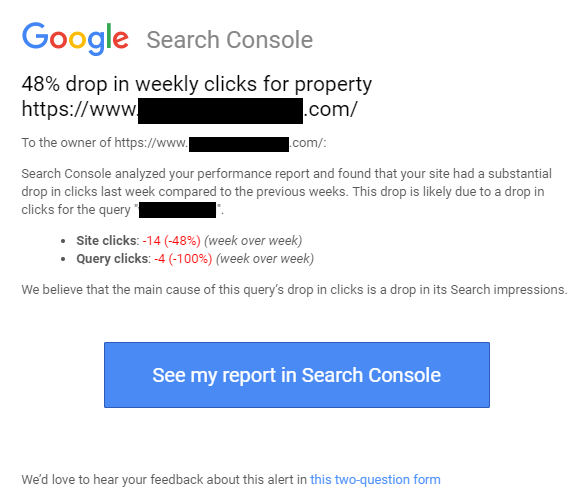 If this week’s data is drastically different, it will send a notification to verified property owners in Search Console to alert them of the problem. It is unclear exactly how large of a drop it takes to trigger the notification. In the case above, Moore experienced nearly a 50% drop in clicks. Of course, the tool has some obvious limits. The first is that it only compares week-to-week data. That means slower downward trends will likely not trigger a notification. Additionally, the notification appears to only be triggered by clicks but does not account for traffic or bounce-rates. The best course of action will always be to regularly check your analytics data to properly assess your site’s performance. There, you will find everything from your click performance, to conversions, traffic, and even demographic info about your visitors. Still, it always helps to have an extra alert in place for when sudden changes happen to your site. That way you can respond to any new issues and quickly remedy any issues that could have led to your drop in clicks. Google My Business has released a new way for business owners to respond to online reviews, giving increased flexibility to when and where you can reply after a review. Now, you can reply to your business reviews from your listing in Google Maps from any desktop device. In the past, replying to reviews was only possible from the GMB app or website. Of course, you will still have to verify your listing before you may be able to respond to reviews. Still, the release of the new way to respond to reviews makes it easier than ever for business owners to reply to reviews as soon as they see them. Along with the new way to respond to reviews, Google has also updated its help document on the subject by adding tips specifically for responding to negative reviews. First and foremost, Google encourages business owners to remember that negative reviews are not always reflective of a bad business. For instance, some customers may have mismatched expectations. In this case, replying to the review can help other customers set their expectations appropriately and provide more customer satisfaction in the future. Do not share personal data or attack the reviewer personally. Instead, suggest that they contact you directly. Investigate the reasons behind the reviewer’s negative impression of the business. Be honest about mistakes that were made, but do not take responsibility for things that weren’t your fault. Apologize when appropriate. It’s best to say something that demonstrates compassion and empathy. Show that you’re a real person by signing off with your name or initials. Never lash out. Never get personal. Always be polite and professional, just as you would be face-to-face. Respond in a timely manner to show that you pay attention to your customer’s experience. It is important to keep in mind that negative reviews will not automatically hurt your business. How you respond can be just as important in shaping the public perception of your brand. A new survey sheds some light into the real reasons why consumers like, share, and follow brands on social media. 63% of consumers follow retailers on social to learn about sales. 60% follow retailers to keep up with new products. 29% follow to show support for the retailer. 23% follow because the retailer shares funny and interesting information. 16% follow because they agree with the retailer’s stance on social and political issues. 36% engage with content because the retailer promises a discount for sharing the post. 36% engage in order to share a product update or sale with their followers. 35% engage because they agree personally with the content of the post. 30% engage because the post is funny or interesting. 29% engage in order to share positive feedback with the retailer. 20% engage in order to share negative feedback with the retailer. Gen Z consumers are more likely to have YouTube (77%) and Instagram (77%) accounts than a Facebook account (74%). Millennials (89%) and Gen X (88%) are most likely to be on Facebook. More Gen Z consumers (56%) are on Twitter compared to Millennials (50%) and Gen X (39%). Snapchat is the least used social network among all respondents (30%), followed by Twitter (36%). 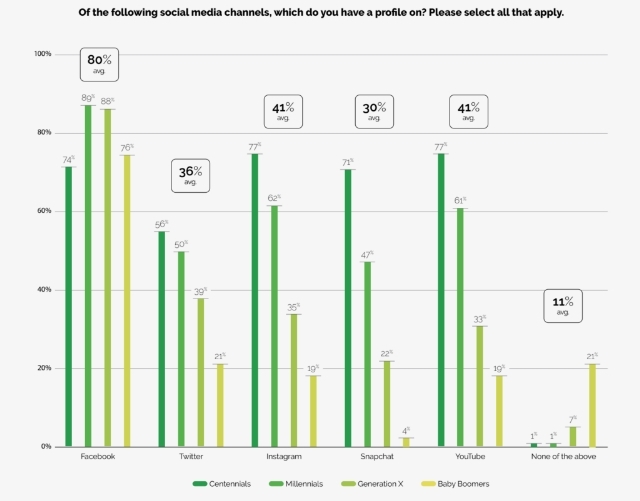 Only 11% of respondents are not on any of the major social networks. Get the full report here to learn more. LinkedIn has released a new ebook aimed at helping social media managers market their businesses across the platform. It also contains some very interesting stats that make a strong case for why you should consider including the platform in your array of social media channels. 45% of all social media traffic to a company’s homepage comes from LinkedIn. LinkedIn’s ebook contains lots of other interesting data and recommendations for how you can leverage this information to create effective marketing strategies for the platform. Check it out here. Facebook is making a major change to how it handles advertising budget optimization. While it may lead to better ad performance, it also gives you less control over your ad campaigns. 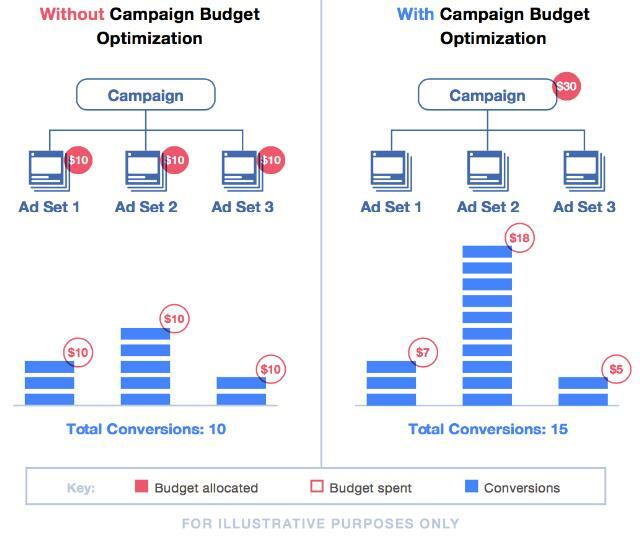 Starting in September, Facebook will make all ad campaigns use campaign budget optimization. In plain English, this means that you will only be able to set the overall budget for your campaign. How much is distributed to each ad set within that campaign will be determined by Facebook’s algorithms and analytics. The main goal of the change is to automatically emphasize the best performing ad sets while minimizing wasted ad-spend on underperforming ad sets. Currently, campaign budget optimization is available as an optional setting. However, in September it will become mandatory for all campaigns. The implementation of campaign budget optimization across Facebook will likely have a significant impact on how brands choose to advertise, but it may pay off in the long run. Facebook claims this form of optimization not only lowers costs but improves ad results at the same time. Capture the most results for your budget and lower your total cost per result. Save significant time with an automated process that eliminates the need to manually shift budgets between ad sets. A simplified campaign management process with fewer budgets to track and re-allocate during optimization. More efficient spending across audiences with a process that finds the lowest cost opportunities across all ad sets and the markets they target. Facebook is announcing the change early to give both brands and advertisers time to begin adjusting to using campaign budget optimization. I would recommend trying it out for yourself now so that you can be prepared for when it becomes mandatory.